Happy Saturday, everyone! I hope you’re up for an exciting weekend. Here’s a quick look at the swatches for the BH Cosmetics Foil Eyes 2 Eyeshadow Palette. BH Cosmetics is well-known for their affordable but high-quality eyeshadow palette. And this beauty isn’t an exception! With Valentine’s Day coming up, you might want to consider getting one of the BH Cosmetics Foil Eyes 2 Eyeshadow Palettes as a gift for your Galentine’s or all the special ladies in your life. We know you are loyal to foil, so we created this Foil Eyes 2 – 28 Color Eyeshadow Palette, featuring additional colors of the dreamy, gleamy ultra-shimmer shadows you know and love in the original. This must-have second edition features more vivid jewel tones, richer neutrals and more icy options–all with the same intense pigmentation, buttery feel and molten metal finish. Rock these high-impact hues–from ivory to amethyst–by blending and layering to ignite unlimited eye looks. 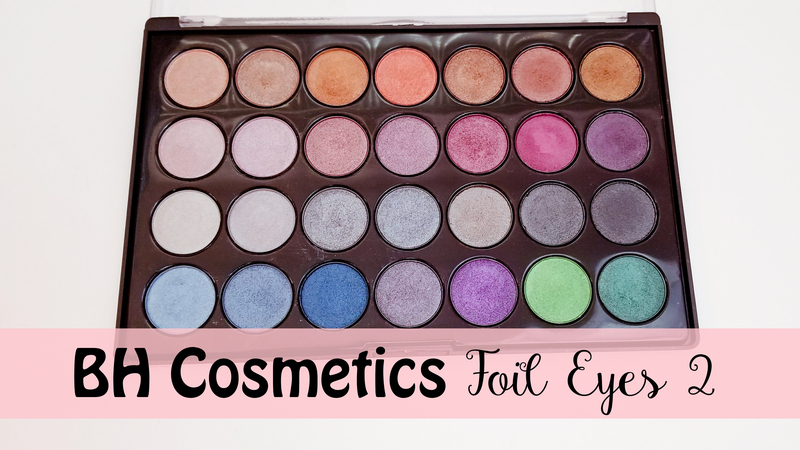 The BH Cosmetics Foil Eyes 2 Eyeshadow Palette contains 28 colors. Similar to many other products by this brand, it is vegan, cruelty-free and gluten-free. The listed price is $13.99 but BH Cosmetics always has a huge sale going on their website. Therefore, you can snag the BH Cosmetics Foil Eyes 2 Eyeshadow Palette for as low as $8.00 – which I did. You can also use Ebates to get 5% cash back whenever you shop on BH Cosmetics website. Honestly, I wasn’t impressed by the packaging. All 28 eyeshadows are held in a thin and cheap-feeling black palette with clear frosty lid. The outer look of the BH Cosmetics Foil Eyes 2 Eyeshadow Palette is pretty boring, comparing to the Take Me Back To Brazil palette. However, do not judge a book by its cover! When you open the palette, the eyeshadows inside are quite stunning and eye-catching. They are definitely pigmented, though, some are a bit more powdery than the others. I prefer applying the BH Cosmetics Foil Eyes 2 eyeshadows by pressing the product on to the eyelid with my finger. It gives the greatest pigmentation and emphasizes the metallic finish of the eyeshadows. The eyeshadows have decent wear time; prepping your eyelid with primer will prolong the wear time of the product. 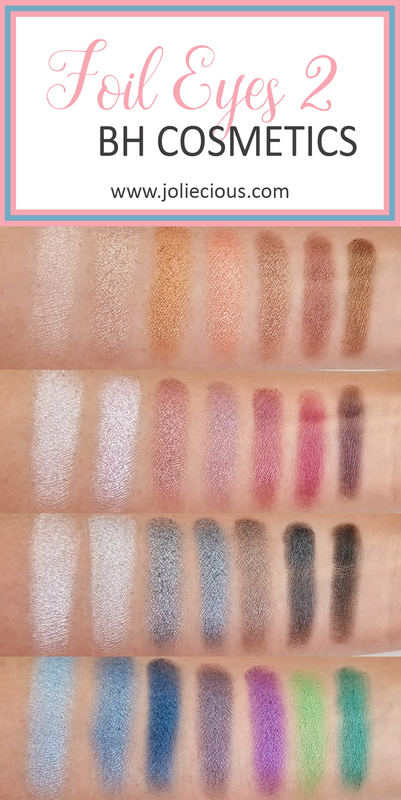 Here are the swatches of the BH Cosmetics Foil Eyes 2 Eyeshadow Palette. Which one is your favorite eyeshadow palette from BH Cosmetics? Are you a matte eyeshadow gal or a shimmery/metallic gal?